Oh, the joys of putting a product online. All you want to do is get it out there. But what is the best way to actually do that without searching and testing and paying way too much for something really frustrating to use? Well, you’re in luck. I’ve been looking at online web stores and merchants that offer something different from Ebay, PayPal, Yahoo and other Open Source solutions. I’m not really pleased with the features, pricing and usability of those and want something a bit easier for me and others to handle. After trying some out and going through a lot of reviews, I’ve come down to three options that have the best overall features and accessibility. Orders are processed via Amazon’s trusted payments system. No merchant account is required. All credit card processing and transaction fees are included. 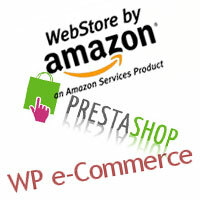 Your WebStore is automatically optimized for search engines. To get all of this through Yahoo Small Business you’ll be paying at least $99/month. Additionally, you’re running your store on the same engine that runs Amazon. Nice. You won’t get the support that Amazon has, and you’ll need a merchant account if you don’t use PayPal, but this is in full development and has a nice set of upcoming features as well. Definitely worth checking out. For those with WordPress sites there’s a very nice little plugin called WP e-Commerce from Instinct. This has some really cool features for a little smaller shop but still is capable of having a lot of products. It’s really easy to set up and has a lot of options and features you won’t find on the others. If you have a blog via WordPress, the last one is a sure bet for getting something up quick. The only drawback (kinda) is you only get PayPal integration with the free version. An enterprise edition is available for a VERY reasonable $15. That allows more payment gateways and multi-image upload (nice) so there’s really no reason not to pay for that. Once again, you’ll need a Merchant account unless you just want to use PayPal. Hope this helps some of those considering putting some product online. If you don’t want to use PayPal or Merchant accounts go with the Amazon Webstore. There’s lots of options and it can cause confusion that you just don’t need when all you want to do is put a dang product online and make some cash. Check-em out. And if you don’t like a payment system you’ve used tell me in the comments! Are You a Solidworks Visualiser?